Too many youthful journalists with energy but a limited grasp of history, geography, sociology and economics - leaving "a large gap in general knowledge". 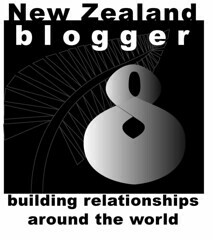 The lack of resources given by the media to covering international stories of "importance to New Zealand". The need for mainstream media to have a better understanding of cultural diversity. Journalists shouldn't confuse healthy scrutiny with cynicism because that undermines the political process. Personality driven media with journalists making themselves the centre of the story. The role of blogs and the tendency for journalists to make "rushed judgments". This edition's special section of research papers from the Journalism Education Association of NZ conference at Massey University last December has been edited by my Wellington colleague Dr Grant Hannis. The journal has only just gone out to subscribers but already there has been plenty of positive feedback. Other contributors include Fortune journalist and author Bethany McLean, who exposed Enron over its gigantic scam, and Dom Post editor Tim Pankhurst over how his paper is facing the challenges of digital media. Hannis himself contributes a revealing research paper about freelance journalists. 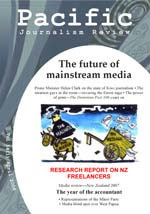 Other articles in the AUT Pacific Media Centre- published journal highlight the Maori Party and the media, bogans in West Auckland and West Papuan coverage plus a state-of-media-health report by Bill Rosenberg. And a host of good reviews are also included. I have had far more respect from Polynesians on this issue than the journalists (and many Kiwi-Polynesians actually supported me). 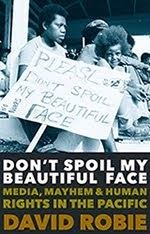 If I was not writing an article on economic grounds, I would welcome more Polynesians and deport half the journalists. 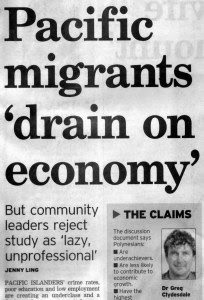 ... if you give a lot of money to a flaky Massey University research project, release the results to a bunch of semi-conscious journalists who are having a slack news night at the Dominion Post, then add a dramatic front-page headline written by a Qantas Award winner for headline-writing, you get something that reinforces racist, xenophobic social stereotypes and helps absolutely nobody. The consensus from the Pacific community meeting convened by the HRC was that the contribution of Pacific Islanders’ to the New Zealand economy and society has been more positive. The meeting encouraged de Bres to invite submissions on the report to create a "broader, well-informed basis" for discussing the issues. "HE HAD wanted to die 'in the streets', says the Philippine Daily Inquirer, "that is, in the act of principled protest, deep in the trenches of a never-ending war against injustice. Instead, progressive Congressman Crispin "Ka Bel" Beltran died after falling off the roof of his modest, mortgaged house, in the act of tending to his family's needs. He was trying to fix the roof before the rains fell." It was a shock when his death came to the many activists, civil society advocates, democrats and journalists in the Philippines, New Zealand and the world who were inspired by his life of integrity. It may not have been a hero's death, but it was still a virtuous one, with a timeless lesson in personal integrity. It showed an astonished nation that it is possible to remain poor while serving in Congress, despite the trappings, the generous staffing budgets, the access to pork barrel funds. Despite all that, the 75-year-old Beltran remained a member of the working class he represented. 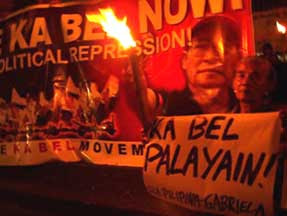 Beltran was detained in 2006 amid a crackdown on progressive politicians, human rights campaigners, unionists, journalists and religious leaders. The congressman was arrested on charges dating back to the era of Filipino dictator Ferdinand Marcos in the early 1980s and were quashed in 1988. Since then, further trumped up charges of sedition were laid. Beltran had been held under hospital detention for sixteen months but an international campaign succeeded in setting him free. The Indonesia Human Rights Committee takes a close interest in the human rights and justice issues in the Asia-Pacific region. We therefore mourn the loss of Congressman Crispin Beltran “Ka Bel”, a great man and an exemplary leader, with his family, his friends and the Filipino people. His untimely death is a great loss to all freedom-loving citizens. His life is a concrete example of the struggles ordinary people wanting to have a better and decent life. Ka Bel had a very challenging and colourful life. From the Marcos martial law to Arroyo’s ‘undeclared martial law’ he never stopped fighting for the poor people. He was a true defender of the workers, peasants, urban poor and other marginalised sectors of the toiling masses. He was also a staunch critic of privatisation, deregulation and other destructive policies of globalisation. Not only was he involved in national politics but also in international issues. Ka Bel also stood against the United States' war of aggression on Iraq and its war on terror. He was steadfast in his call for respect for national sovereignty and international unity against foreign intervention. As a parliamentarian, he was incorruptible and stood for his principles. 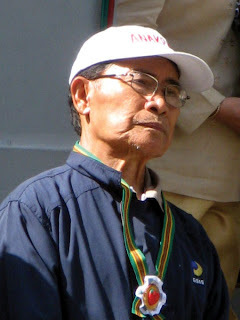 In his three terms in Congress he was awarded the Filipino of the Year and Most Outstanding Congressman honours for four consecutive years from 2002 – 2005. In 2006 was judged part of the Congressional Hall of Fame. One of his famous quotes was: "If helping the poor is a crime, and fighting for freedom is rebellion, then I plead guilty as charged." workshop - 33 years after the first j-school was established. The University of Papua New Guinea led the way in 1975 - the heady year of independence - with a j-school established with NZ aid by the late Ross Stevens. Sadly, Ross would have turned in his grave if he saw the state of UPNG's j-school today. In his time (1975-77) on the Waigani campus, the teaching was in a creative "dungeon" in the bowels of the Michael Somare library. Today, journalism is housed in the relatively recent Ulli Beier building - in an air conditioned multi-purpose lab - but with no sign of actual journalism. Five e-Macs lacking a printer and a network. Hardly the stuff of a newsroom. Gone is any sign of the history and tradition of what was once the finest journalism school newspaper in the Pacific - Uni Tavur (first Pacific j-paper to win the Ossie award for newspapers in 1995, competing against Australian and NZ publications). That success was during my era at UPNG when I negotiated with the Post-Courier to print the paper every fortnight for 12 editions a year. Thanks OP for your great support in those days! What is a journalism school without its own press and broadcast programmes? It's hard to imagine that UPNG has 100 j-students plus these days. What do they do? And what is their employment ratio? There are simply not enough jobs. Still, I was pleased to see many of my former students doing so well in the media, people like Titi Gabi, news director at PNGFM Ltd, and Jackie Kapigeno, news editor at The National, and her deputy, Christine Pakakota. Well done team! Good to see Freddy Hernandez still going strong in The National newsroom - check out his letters from Moresby. And a delight to see Jada and team at Wantok. Now let's not get too nostalgic about PNG. Back to UNESCO and Abel Caine - they deserve a big bouquet for getting this much belated workshop off the ground. And already the second such workshop is in their sights for next August at the PINA convention in Vanuatu. Although some j-schools are more fortunate than others in the region, many of the issues about facilities and resources (including human) are familiar to everybody. And a sharing of issues and a draft plan for the future is encouraging for Pacific j-education. In my book, the only downside of the workshop was the failure of the new polytechnic j-schools to get their act together (apart from Fiji Institute of Technology, which was well-represented by Elia Vesikula) and be represented. Invitations to Samoa, Solomon Islands, Tonga and Vanuatu were wasted. I wonder what possessed AusAID to lash out money on establishing these new schools when the existing j-programmes are so under-resourced as it is. There are simply not enough facilities and human resources to go around all the Pacific schools. The University of the South Pacific with the only regional regional j-programme has the capacity to continue running courses for everybody, providing the industry backs USP to the hilt. Its postgraduate programme is also developing quite nicely. The sheer scale of PNG means both Divine Word (especially) and UPNG have much to offer. But UPNG needs a huge injection of assistance to get it back to anywhere near its former status as the leading j-school in the region (see my book Mekim Nius for the history). Maybe UNESCO could offer a volunteer for a two-year project as well as resources? Migrant women have had to struggle against stereotypes for years. 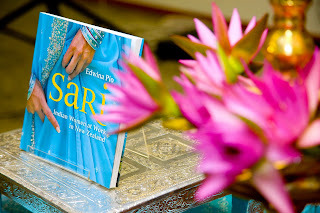 Carly Tawhiao talks to an author whose new book Sari challenges these stereotypes and offers a message for the future. Groups seeking independence for West Papua have in the past been divided. Now, reports James Murray, unity is the buzzword and activists have joined forces. The Jayapura Mama Mamas, a group of women market workers, face eviction from their trading place in the centre of West Papua’s capital city. Carolyn Thomas talks about their lives to Judith Crimmins, who has recently returned from West Papua. And Dylan Quinnell is on his way back from Jakarta after some remarkable experiences in Indonesia over the past few months. He even speaks passable Bahasa, I'm told. I'll check it out when he gets back. Next stop for him? China. Who said New Zealand j-schools should only be training for NZ media? In these days of globalisation, our graduates go anywhere - wherever the market is ready for their well-developed skills. Check out Dylan's account of his experiences. The student journo Asia-Pacific stories (another batch will be online at the Pacific Media Centre on Monday) are also featured under the PMC logo on Scoop World. 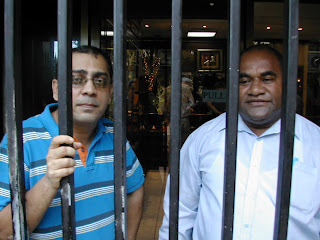 Media freedom with 'responsibility' - or chaos in Fiji? From a PR perspective, the Evan Hannah affair looks pretty bad on the interim govt - and we'd be right to be condemning the expulsion - but one of the basic rules of journalism is that there are always two sides (sometimes more) to a story: That the IG is not divulging all the reasons for its actions, is a little frustrating for most reporters who are led to conclude that there are no genuine reasons for the expulsion. But the warning signs have been there all along - I think publishing of the [Dr John] Cameron opinion piece was a push too far over the line . Any journalist who has basic knowledge of subjudice laws knows that one is not supposed to discuss matters before courts in the media. I am trying to take an objective stand on this matter. But my conclusion is that both sides - media and govt - have made mistakes. The question is how far do each test each other's patience. I feel that the media in Fiji is relatively a lot freer than most nations. That the military has let by and large the media do its work without much interference is a plus considering we've had a military coup not 15 months ago. Should the media continue to push along a line that could lead to sanctioning of the media on more stringent terms than those that are spelt out in the bill of rights of our constitution? I don't think so. could lead to chaos in the nation? as there are many more dynamic factors in the Hunter case. 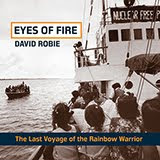 What should be the eve of a global commemoration - when we celebrate the contribution of all forms of media to development and the empowerment of communities - we are reminded that we live in the shadow of a power that chooses to control the way in which information and communication is developed and delivered. We live in a time when all people, but especially rural and remote communities, should be able to freely access a range of information, as well as feel safe and confident to share their viewpoints, in order to actively engage and participate in the the return to parliamentary democracy. Given the current campaign of the National Council for Building a Better, this action does not augur well to enhance the opportunity for a diverse range of viewpoints to be shared. It is not the basis from which we will hear from the ordinary people, who are suffering the most (in silence) who have the biggest stake in defining the road to sustainable peace. This does not provide the political platform for peace and stability. Fiji's current leaders need to be reminded once again "that you cannot shake hands with a clenched fist". Earlier this afternoon, the Fiji Media Council held an emergency meeting and chairman Daryl Tarte issued a statement saying the council was "shocked and dismayed" by the mockery of the deportation. It added that the latest move against the media had come when the nation's media industry was still trying to come to terms with the expulsion in February of Fiji Sun publisher Russell Hunter, another Australian expatriate. Pictured: Evan Hannah (right) being escorted out of his Tamavua home in Suva by officers last night. 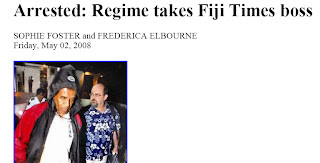 - Fiji Times Online.